New York born, New York raised, baseball fan forever. Everything from top ten lists to game previews to the how and why of America's Game. Yankees radio play by play man John Sterling has had some interesting home run calls over the years, but which stand out the most? Well, we’re ten games into the Major League Baseball season, and the New York Yankees are 4-6. To some, it’s not a surprise, and to some, the team is actually overachieving. I don’t know if I’d go that far, because I thought the Yankees were better than people were giving them credit for, but it’s definitely been an interesting start to the season so far. To start (no pun intended), Alex Rodriguez has been the team’s best hitter. Look, we all knew that expectations for Alex Rodriguez entering this season were lower than the approval rating of The Phantom Menace, and for good reason: Rodriguez missed all of last season due to suspension, and he hasn’t been a truly solid player since 2011 or even 2010. Yet, Rodriguez is off to a .344/.432/.781 start with four home runs and eleven runs batted in…not bad, old man. One of the best parts about Rodriguez’s hot start isn’t just the fact that every baseball fan that doesn’t root for the New York Yankees is losing, but also that we get to hear John Sterling’s home run call for A-Rod again. Sterling, who has been the Yankees’ radio announcer since 1989, ends every Rodriguez home run with a call of “It’s an A-Bomb…from A-Rod” and I like to mimic it on my Twitter, in large part because it seems to annoy the A-Rod hating baseball fan. There’s a lot of people out there that seem not to like Sterling, and I honestly can see why. He makes plenty of mistakes behind the mic, and some of his home run calls are…less than stellar. But, that’s a large part of why so many people do enjoy Sterling’s work: his signature home run calls for every player. It doesn’t matter if you’re Curtis Granderson or Colin Curtis — Sterling will find a way to make a home run call for you, and it adds a certain…uniqueness to the game. But, which are the best and worst home run calls from John Sterling? Keep in mind, I’ve left off many calls, but this isn’t an all-time list of every call that Sterling has done (if you are interested in something like that, though, there’s a Yankee blog that’s been collecting as many of John Sterling’s home run calls as humanly possible. How could we forget Nick Green’s home run call?) and this list is not in order. I may put player A’s call above player B, but that doesn’t mean I enjoy the call more. Think of this as a non-ordered list, but it’s only ordered in terms of sub-headings. 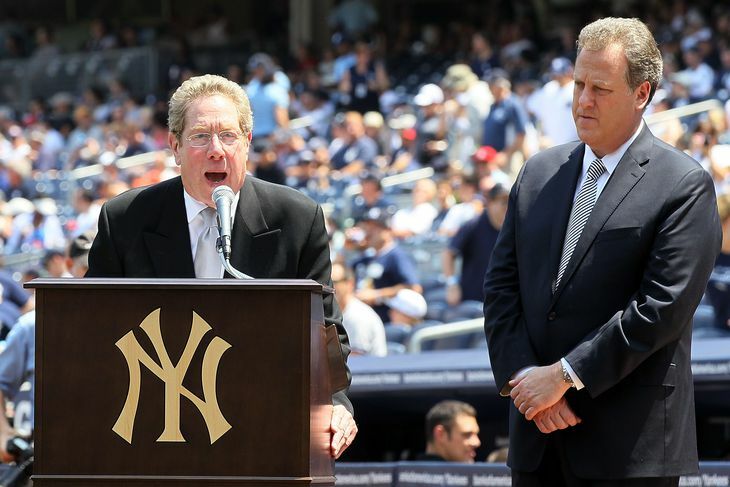 So, without further waiting, let’s get right into the best and worst of John Sterling. Well, we may as well start off with the one that helped inspire the creation of this article. You know, despite all of his flaws, I still remain and will always be a huge fan of Alex Rodriguez, and this home run call was one of the things that helped endear me to him. We have two instances of history (the Atomic Bomb and Alexander the Great) being used in conjunction with a baseball hitter in a way that, actually, makes sense. Nice one, John. This was a call I didn’t get to hear too much, seeing as Spencer played for the Yankees when I was a small child, but I’ve always had a thing for this call. There’s just something about the execution of this call, and the rhyme with Spencer and dispenser, that makes this one of Sterling’s best calls over the years. This one’s easy. Not only is it a pun on the song ‘Disco Inferno‘, but there’s some great alliteration here and it’s just an overall fun call. Plus, the ‘bern, baby, Bern’ part is pretty catchy, and I enjoy it a lot. I love this home run call, even if we haven’t even heard it for a full year. When the Yankees acquired Chase Headley last season from the San Diego Padres, I had a feeling that Sterling would go for a Headley is deadly pun, but the bank on Chase part is an excellent addition. As you’ll see below, some of Sterling’s more recent calls haven’t been anywhere close to good, but this one is great. There’s not much to say here, other than I love the Pat Benatar pun; the call, of course, is a reference to Benatar’s hit “Hit Me With Your Best Shot” from 1980. Again, not bad, John. What. I’m linking this just so you can see how ridiculous this is. What a terrible call. A Drewskie? That may be one of the worst calls I’ve ever heard, and this is coming from someone who loves John Sterling. I was joking about it on Twitter this week, but Sterling’s call really should have been something along the lines of, “Stephen Drew that one up perfectly!” or something with a play on words with Drew. But Drewskie? What? No. No. No. No! No. What kind of call is this? Please make this stop. Please. Then, you realize that Sterling sings part of that call. Please, I can’t take any more of these awful calls. Honestly, some of the more recent Yankees have had the really bad calls, because I can live with some of Sterling’s older calls. Let’s be real for a second…I would much rather have Sterling’s call for Gary Sheffield (The Master Sheff! A Sheff Special!) than Stephen Drew’s call, and I loathed Sheffield’s call. As a kid, I flat out loved this call. Some years later, and after having heard it so many times, this falls under the eh section because of the second part. The Sayanora Kid? I would have preferred Sterling just stick with the thrilla by Godzilla part, but it’s not an awful call. I get that Matsui is Japanese, and Sterling likes to show where players come from, but this is too much. Again, this is another call that isn’t bad, but would have been perfectly fine if Sterling cut it off after the first sentenced. I like the Russell shows muscle part, but then Sterling has to add the French…we get it, Martin is from Canada and can speak French. Yes, this may shock some people, but this is probably my favorite John Sterling home run call. Everything that you want from a Sterling call is here; you have the pun, the play on words, and it’s said in such a fluid way time after time that you can’t help but repeat it when you hear it. This used to be tied with Alex Rodriguez’s home run call, but this call has just grown on me so much over the past few years that I can’t help but put it there. So, is John Sterling an amazing radio play-by-play man? Well, I don’t know if I’d go that far, but I will say that it’s always a pleasure to listen to him and his…unique home run calls. Hopefully, Sterling can get back to making some better calls, because some of the recent ones have been pretty bad…I need to go get the Chris Young and Stephen Drew ones out of my head soon. What are some of your favorite John Sterling home run calls? Make sure to chime in on the conversation by tweeting me at @JakeElman. Death of the Baseball Role Model? あわ-ただしい on Is Youth Baseball Dying?